I found Mr Mbata sitting on a rock beside the road between KwaDlamini and Ndaba. He was wearing a loose coat, and baggy trousers tied at the waist with a piece of rope, in a way that accentuated his skinny frame. His face was wrinkled in the extreme and he was greying in the way that prompted me to greet him respectfully as “Kehla”, with both hands raised, as is the custom. His return greeting revealed a mouth crowded with outsized yellow teeth that appeared to have collided chaotically during a failed attempt to escape his maw. His discarded “gwaai” of Boxer tobacco rolled in newspaper, lay smoldering at his feet, giving off an aroma that took me back to my childhood days in the potato fields. Ironically, through the open gate in front of us, lay a field of potatoes. After our greeting I remarked on how good they looked, and asked if they were his. “No” he said. They belonged to the man for whom he was currently working. It hadn’t been clear to me that Mr Mbata was working. It turns out that his job was to prevent any goats or cattle entering the field through the open gate beside us. The gate (in perfect working order) lay open on account of the fact that two women, working way off in the distance, had entered that way to sow seeds in a ploughed section of the same field. After asking after Mr Mbata’s well being, I remarked on the river that flowed silently by, just over the road from us, and on the tributary that entered the main flow a few hundred yards downstream. Mr Mbata, it turned out, knew a lot about both stretches of water. He confirmed that the name of the tributary was indeed the Mtshezana. Then he proceeded to correct me in the name of the main river, with its Zulu name, The Mtsheza. He explained the nomenclature of the suffix “ana” indicating the child of the main river, being the smaller one that joined it. All this was with hand signals and a deeply furrowed brow, which aided my painfully slow and unreliable understanding of his Zulu. 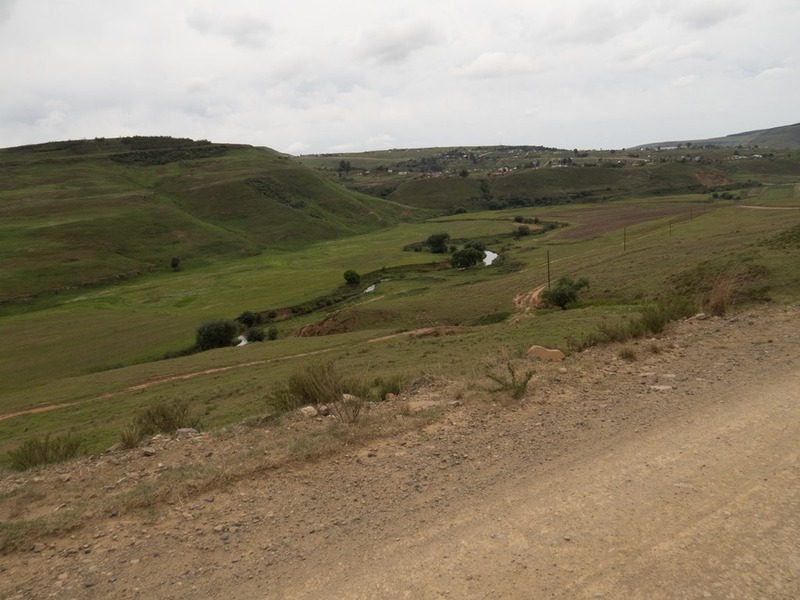 The Mtshezana was often dirty, due to the ploughing that took place in the valley below Ntabamhlope from which this stream, and its own tributary, the Nkombane, flowed. The Mtsheza itself is often dirty in summer too, and we quickly arrived at an understanding that we both knew this already. I enquired about the fish in both bodies of water. My Zulu it seems was adequate. Mr Mbata described the fish with scales. Then he described the fish with spots. I said I knew those, and liked them. Sensing my enthusiasm, he taught me his name for them. “Lungu” he said they were called. I asked him if there were “Lungu” in the Mtshezana, and he replied in an “of course there are!” manner, suggesting that perhaps he shared my enthusiasm for Lungu. Suddenly Mbata leapt to his feet, catching me by surprise. He set his feet apart for greater stability, and then lurched forward apparently defying the fact that all the blood must have drained from above his shoulders. He swaggered into the road, while I looked on, somewhat taken aback. Then he bent over with great effort, picked up a piece of clay, and lobbed it at the goats in front of us in the road. Of course…I had clean forgotten that unlike me, Mr Mbata was at work! The goats bleated and retreated, leaving us to our important river discussions. The fishing was good in the river, reported Mbata as he sat back down on his roadside rock, but not now. The water was too clean, and the Lungu would be able to see me. I should wait for the rains up in the mountains, and then I could attach a worm, or if I liked, a piece of meat, to a hook and throw it into the current. Then I would catch Lungu for sure. “Big ones?” I asked. “Big ones and small ones” he replied holding his gnarled hands apart and moving them backwards and forwards across a range that I expected. Clearly Mr Mbata was telling the truth, and was not prone to exaggerated fisherman stories. I liked this man. We chatted a while about this and that. The weather. The planting date for various crops. When our conversation faltered and a silence fell, I started to bade him farewell. He quickly reached under his loose coat, and produced with pride a Nokia 3310, and asked me to enter my phone number, so that we could converse again and enjoy the long term fruits of our friendship and mutual interests. I obliged, squinting at the badly scratched screen in the bright sun in an attempt to check that I had entered my “isibongu” correctly. Then we called one another on our respective devices to test the numbers, and his old face shone in delight as our phones lit up in turn. The miracle of technology! I bade him a final farewell, photographed the river, and drove off up the hill, deep in thought as I tried to recall all he had said, and see if I could use my closure skills to eke any more information out of his unabated string of Zulu. This entry was posted on December 8, 2017 by trutta. It was filed under Streams and was tagged with KwaDlamini, Ndaba. Mtshezana. 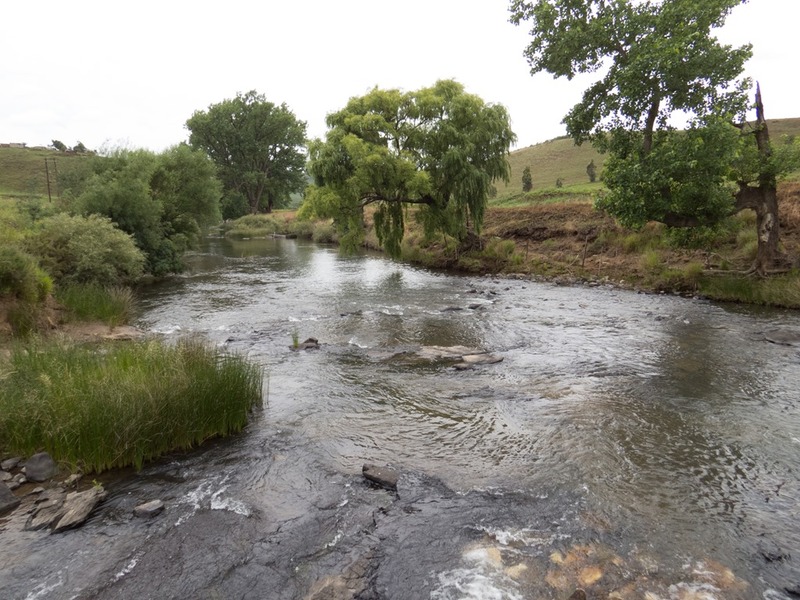 Mtsheza, Nkombane, Ntabamhlope, Trout in tribal lands. Nice one Andrew. There are two Mtshezana, the other a tributary of the Bushmans? Both on the Bushmans (Mtshezi), Peter. The one higher up is the one you and I know. This tributary joins down in the tribal water opposite the old Rockmount homestead. Interesting and confusing that there are two streams with the same name within 20kms of one another! Love it Andrew. Fabulous story. I do hope you have enough future encounters with Mr. Mbata to continue our reading. Best! Thanks Les. Indeed: Hopefully time will permit more trolling around that valley in search of Trout and interesting characters. Damn fine narrative, love dit! 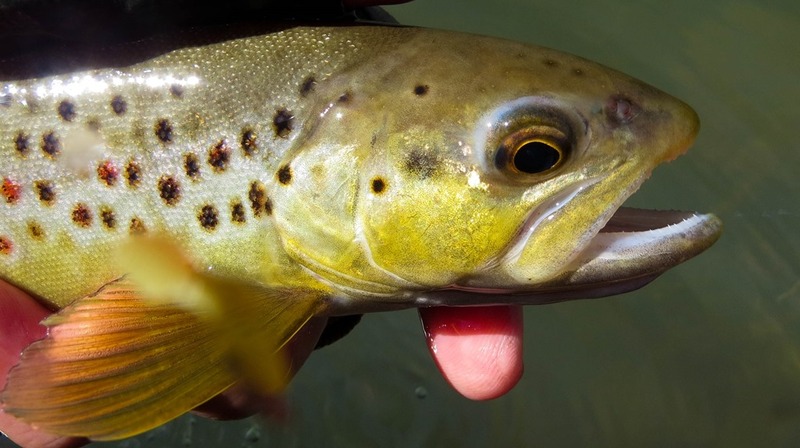 A fine narrative concerning two men, two cultures, two different ways of life brought together by waterways and trout.